Salem was a great success. We sold out the entire weekend, and started a waiting list for the possibility that we offer flights on the way back home in September. As in many cases, it was the people we met that made it special -- from flying farmers over their own fields, to Naval Airship Veterans, to WW2 pilots that had flown missions over Friedrichshafen Germany and proud grandparents with their beaming grandchildren, the joy of airships was being felt in Oregon, and we look forward to being able to return in the future. Now we head for Seattle. Follow us here on the blog and on the tracking page as we make our way to Paine Field in Everett and look for us in the skies over Everett as we fly press and dignitaries this afternoon. We will begin offering passenger flightseeing tours later in the week. To book, just call our reservations specialists at 650-969-8100x111. 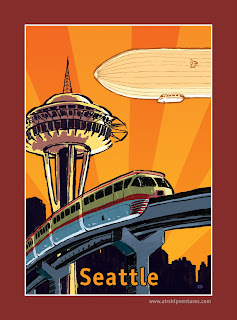 We can't wait to see the sights of Seattle, and we hope as many of you as possible will join us!